We should be attendant to any story that involves love, even when it’s the strange and wonderful bond between a cat and human. Earlier this summer my cat died. I know it’s not important in the scheme of things, but it left me reeling. For days I was buffeted by my grief in the most unexpected places: in the supermarket checkout line (no longer any need to buy pet food or litter), riding the subway (sitting opposite an elderly woman with a tiny, playful dog in a tote bag), and, of all places, at the Starbucks drinks counter in Hell’s Kitchen (where a barista called out a name that sounded similar to my poor kitty’s). It was embarrassing to respond like this. I mean, I’m a grown man. It struck me as unseemly to mourn for a little pet the way I was until I finally understood what was going on. He was a lilac point Siamese. My husband and I had adopted him and his inseparable brother in early 2002, just a few months after September 11 when the nation and New York in particular was still stricken by the terrorist attacks. The pitilessness and cruelty of what had happened to the city was still on many people’s minds. My own had blanked at the glare of it. To me it felt like, and it turned out to be, one of those moments in history when a line is temporarily drawn under human progress. It felt as if America and the world had stepped into an unsettling new era of uncertainty. It turned out to be the case too. Between the endless color-coded terror alerts on TV and the drumbeats calling for war, I wanted something to remind me that life was not entirely regrettable. Something creaturely and reassuring and human scale. It didn’t take long for me to decide that this would be a cat. My husband was not convinced. Recent events had proved to him that nothing was fixed, that people could not be trusted, that your life could end without explanation or ceremony between the ordering of a coffee and sitting down at your work desk. In that existential absurdity, why subject yourself to more needless complications, he asked, not unreasonably. But I’m Irish, which means when I make a decision it stays made. Within a week I was filling out an application at the Humane Society on East 59th Street. 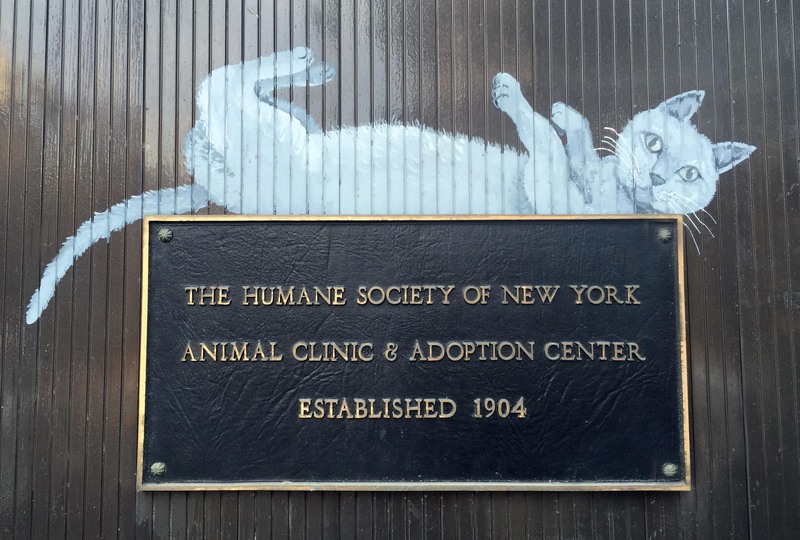 Founded in 1904, it has cared for abused, ill, or abandoned animals in New York City for over 100 years, and the scope of its operations has only grown. On the way there I had pictured myself picking up a scrappy, spirited little cat and when I arrived it turned out there was no shortage of them waiting to be brought home. But on impulse I asked if this was all of them and the female attendant told me that there were some I hadn’t seen in another room. We took the rickety elevator up another story and I walked into a room where ten full-grown cats were sitting up or sleeping in their metal cages. All of them were delightful, but for some reason I walked to the end of the long room to the very last cage. And that was the first time I saw him. He meowed at me with that distinctive and funny Siamese yowl. He clearly wanted to be let out. “Oh, this one is calling to you,” the attendant said wisely, so she opened his cage. He stepped out, stretched luxuriously, and then right away jumped into my lap. I had thought to choose a cat, but the truth is one chose me. His brother, the shy and sensitive one, held back in the cage until he saw the bond that was opening between us. Then he leaped up to join his brother in my lap, almost knocking me over. It delights me now to remember all of this. I still have a sense memory of the two of them snuggling up to me, placing their curiously heart-shaped heads under my chin on that first afternoon. A day earlier I had no pets, now I had two. When I brought them home, the more spirited one explored the apartment like he was stalking the Serengeti, but the shy one holed up in the bathroom for hours and had to be gently coaxed out with soothing words and the promise of food. In Ireland I had grown up around animals – devoted dogs that accompanied me through every year of my childhood, two palomino horses that taught me the exhilaration of racing along an empty strand in County Donegal, and lazy cats that were quirky and affectionate, but not to be toyed with. I learned about farm animals too, how each one had their own character, how much they could respond to a little bit of affection. Both of the my newly-adopted Siamese cats were young, but already full grown. Their previous owners, an unnamed gay couple, had surrendered them to the society when it turned out that their new apartment in another state would not permit pets. I wondered at their apparent heartlessness. Looking at my two new arrivals, I was reminded of an observation made by the artist Auguste Rodin. Cats, he said, are living sculpture. My two new ones could make seen-it-all veterinarians gasp at their beauty. I could not imagine how their two previous owners had willingly given them up. In the weeks that followed, we began to get more clues. Both developed dangerous viruses from their long stays in the adoption center. Our kitchen became a triage where we slowly nursed them back from death’s door. After that one of them thrived and the other, the shy and more serenely beautiful one, struggled on and off with an irritable bowel until the very end of his long, happy life. Their occasional and serious health challenges only made us more aware of the responsibility we had taken on. They literally needed us to survive. This meant that we often had to prioritize something other than ourselves. That’s a healthy thing, no matter who or what you’re prioritizing. Siamese cats pick one human. Once they do the bond is unbreakable. The spirited one picked me and the shy one picked my husband, ironically complimenting our own characters. My cat was fearless and affectionate, and my husband’s cat formed the strongest bond I have ever seen between a human and an animal. It was kismet. Reading about other people’s pets can be as deadening as reading about other people’s dreams, I realize. But we should always be attendant to any story that involves love. For fifteen years, those two curious cats were there for our birthdays, holidays, summers and winters, for war and peace, for triumphs and failures, for the thousand natural shocks, always ready for a head scratch or a little chin rub. Home and the heart and best part of home. We really got to know them. My cat was headstrong and aloof, but he had the heart of a lion, and my husband’s was so sensitive that if you even looked at him crossly he would hide until you apologized. They were hilarious, in other words. They were endlessly surprising. I miss them like I miss people. So when I finally understood what was happening to me last month, that I had now said goodbye to two adored companions that had accompanied me on a long voyage, my deep sorrow began to make sense.